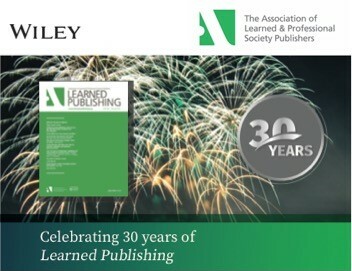 This year we’re celebrating the 30th Anniversary of Learned Publishing and marking the occasion by looking back over three decades to reflect on how scholarly publishing has evolved. Take a look at our video clip of Pippa Smart and Lettie Conrad, North America Editor, as they reflect on the key changes to scholarly communications. From the advent of digital publishing to disruptive new business models, Learned Publishing has been at the heart of these changes, serving as a record of the transformations in our industry. See our interactive timeline, produced by Wiley, which looks back at notable developments, news and most cited articles in Learned Publishing's 30 year history.